There are certain phenomena that are unique to fall: leaves changing color, crisp air, nights getting darker earlier, harvesting, and the start of a new school year. Fall is a season full of change. One thing that stays the same whenever autumn rolls around is the need for good, quality outwear that is perfect for layering. 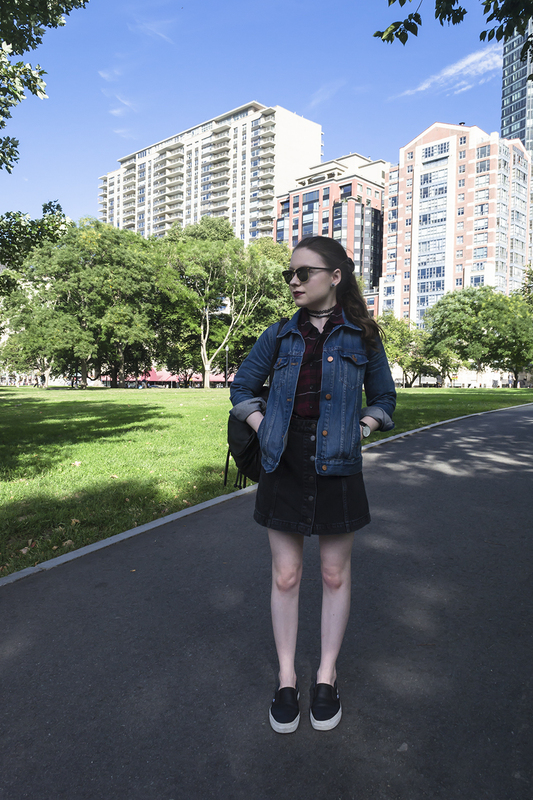 A denim jacket is a fall essential. It's just the right piece to throw on as you head out the door and can be styled in infinite ways. When it comes to denim, Madewell is the ultimate destination. Their denim collections are designed for effortless dressing that is especially important as a busy college student. 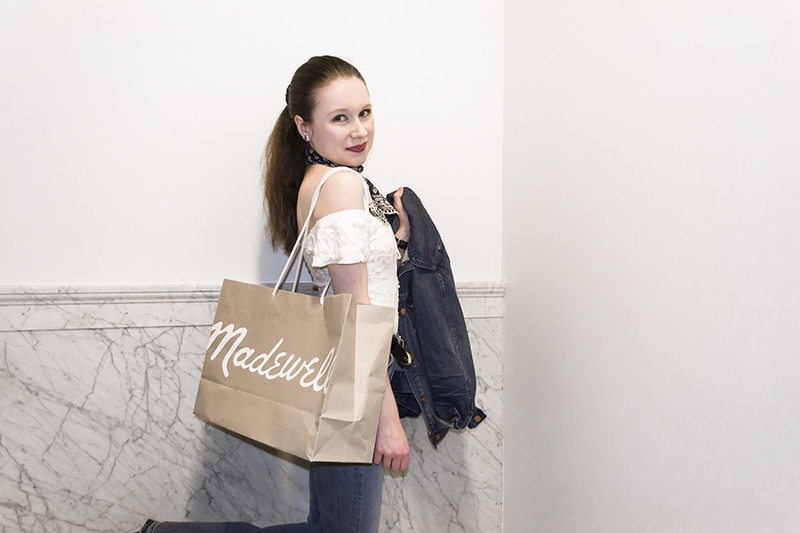 Madewell offers a 15% off college student discount year-round in store when you present your school ID. How awesome is that?! 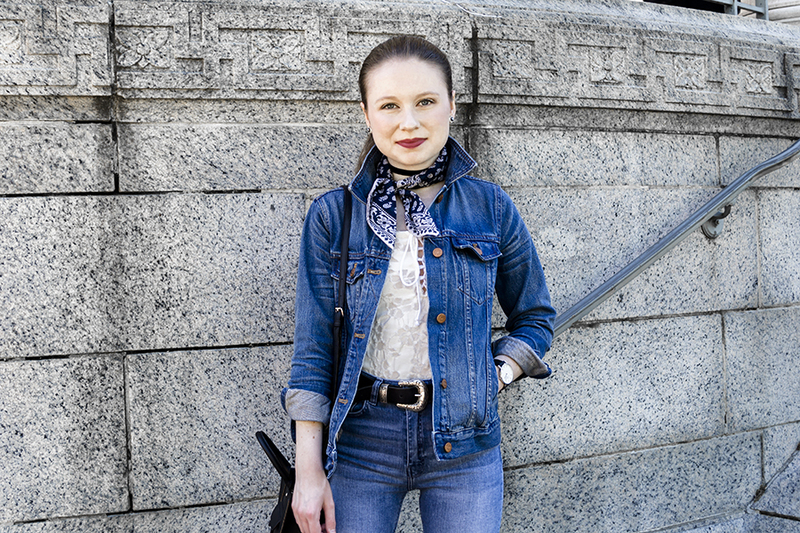 Madewell so kindly gifted me the 'jean jacket in pinter wash,' which I never want to take off, and 'bandana' to easily add a vintage vibe to any look. I have a few denim jackets and this Madewell one is my favorite of them all. The fit feels custom made and the true-blue wash looks cool with any piece of clothing. It is also incredibly comfortable, made of the softest denim I've ever touched. I like mine with the sleeves pushed up and collar popped for attitude. Perhaps I should start naming my denim jackets since they each have their own personality. Help a girl out and comment what I should name this one! 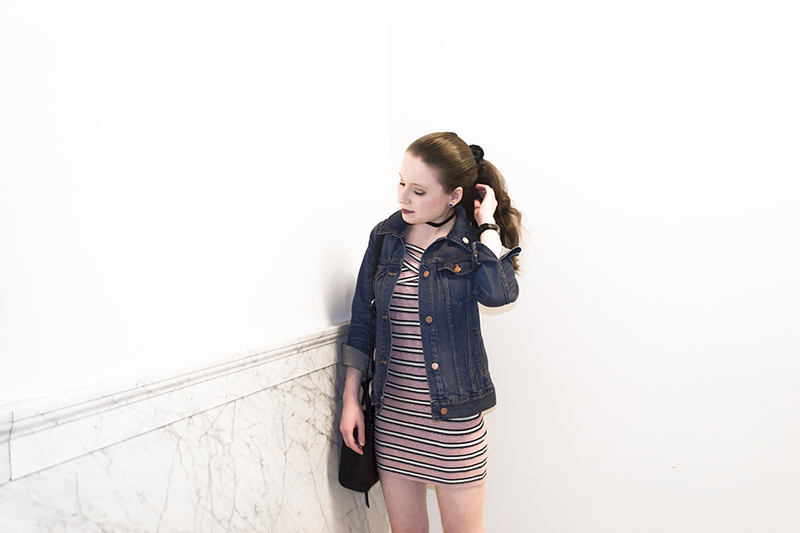 While you're brainstorming what I should call this spunky jean jacket, I've put together a few looks to show how I style the timeless piece. 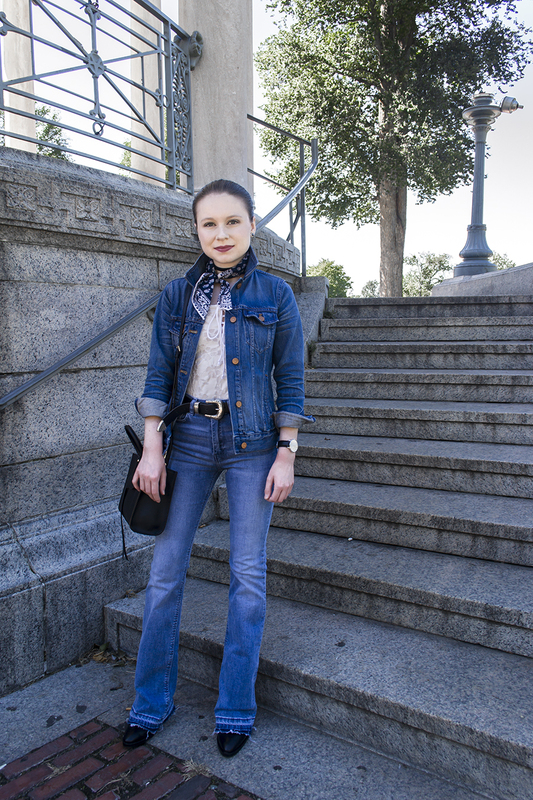 In this first look, I'm playing up the retro, Rock 'n' Roll, rebel heritage of the denim jacket. The double denim pairing is inspired by the hippie movement of the '60s and '70s, nodding to the infamous Woodstock musical festival. 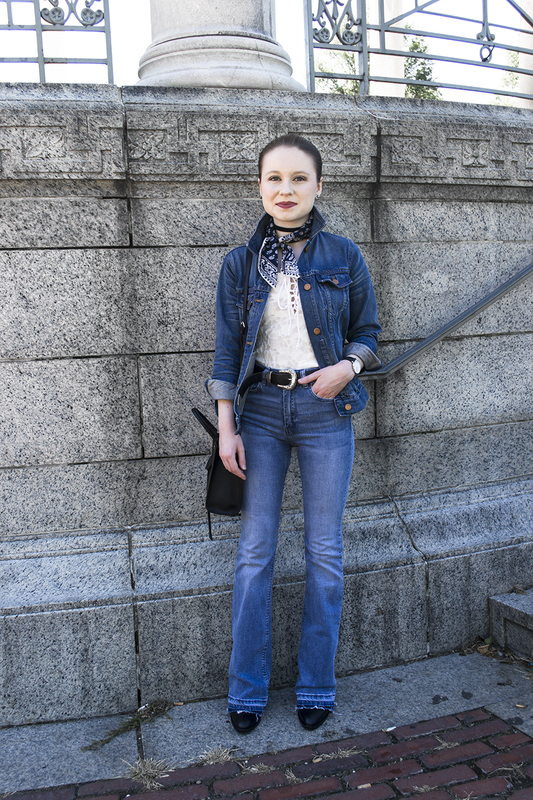 A delicate white lace-up blouse tucked into frayed hem high-waisted flare jeans makes the denim jacket pop. I tied the 'bandana' around my neck to frame my face and draw attention to the drama of the popped collar. A black bag, shoes, and accessories break up all the indigo. I'm with the bandana. 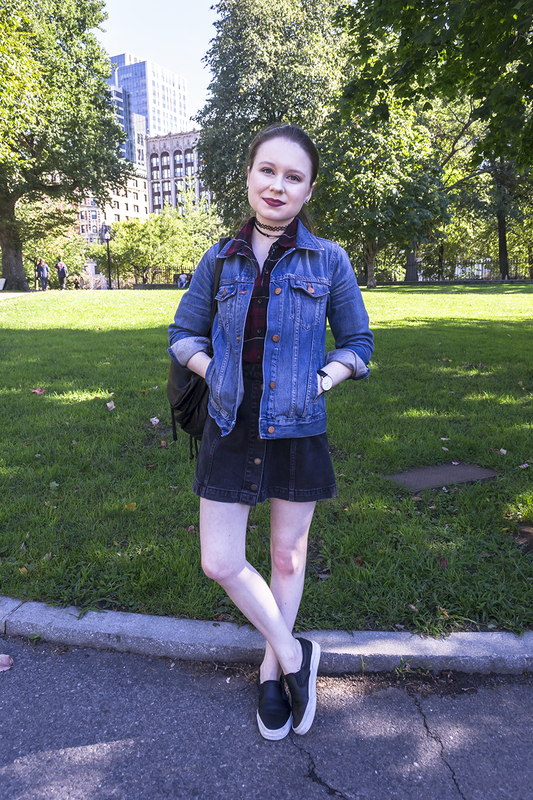 A denim jacket is undeniably campus-cool. For this look, I'm paying homage to preppy school spirit, but with an edgy spin. 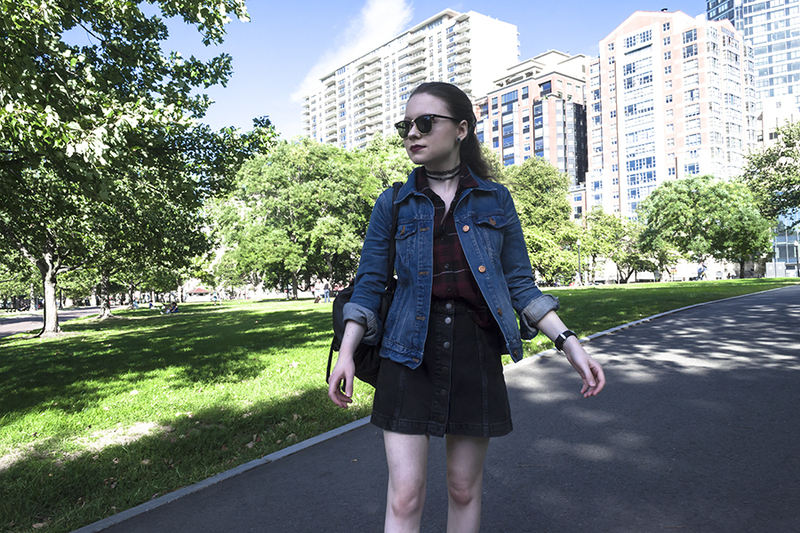 Since plaid has a collegiate vibe, I paired my denim jacket with a flannel that's the perfect mix of prep and punk. Denim skirts also have that schoolyard feel, so I'm wearing this black button front one that's a bit unexpected. 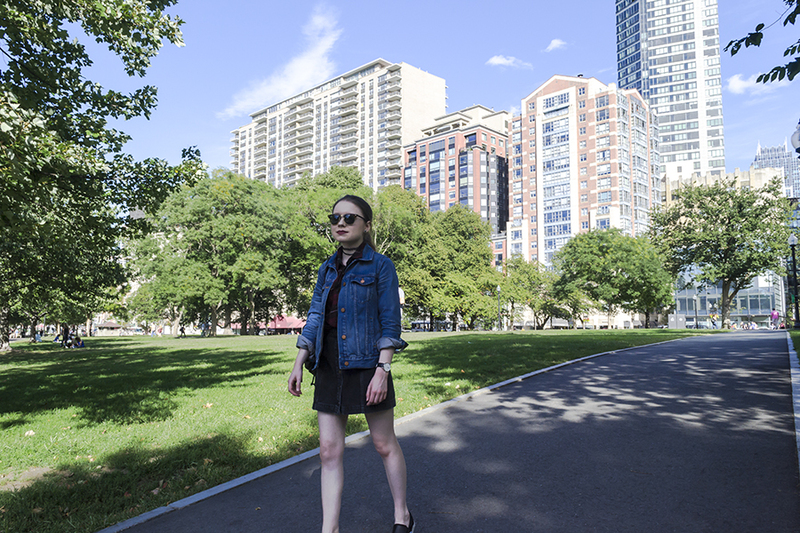 Sneakers keep the outfit laid-back, and classic accessories like an understated wristwatch and sunglasses clash with grungy ones like chokers. A leather drawstring backpack holds the essentials for class. I'm being schooled in denim. 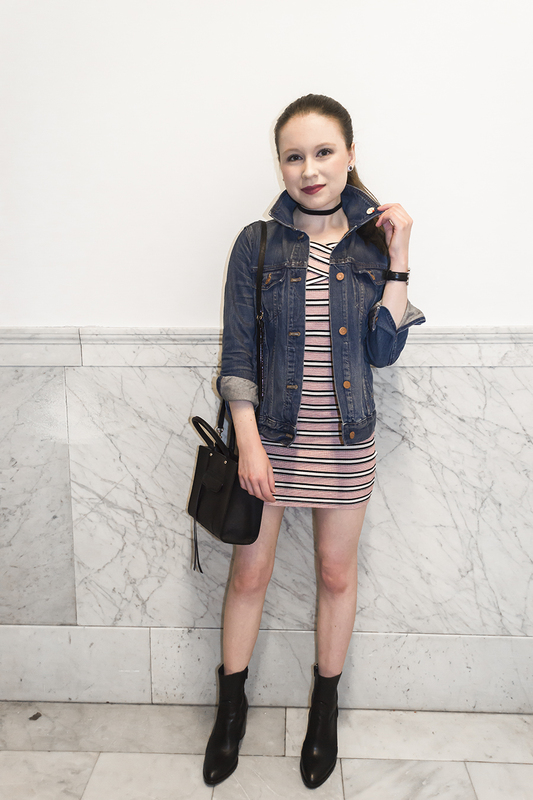 My final look shows how a denim jacket is the perfect piece to throw on over a mod mini dress in the fall. It relaxes the look and keeps you cozy, especially if you have bare legs. It's also a simple way to dress down during the daytime and still look put together. I added an emoji pin to the jacket, also from Madewell, for a fun and techy twist. This emoji is the kissy face, my favorite of them all. Decorating a denim jacket with pins has become my latest obsession. It's Pinterest IRL. This look is giving me mixed emoticons. Thank you again to Madewell for the wonderful gifts. I'm looking forward to styling the denim jacket and bandana in many more ways. 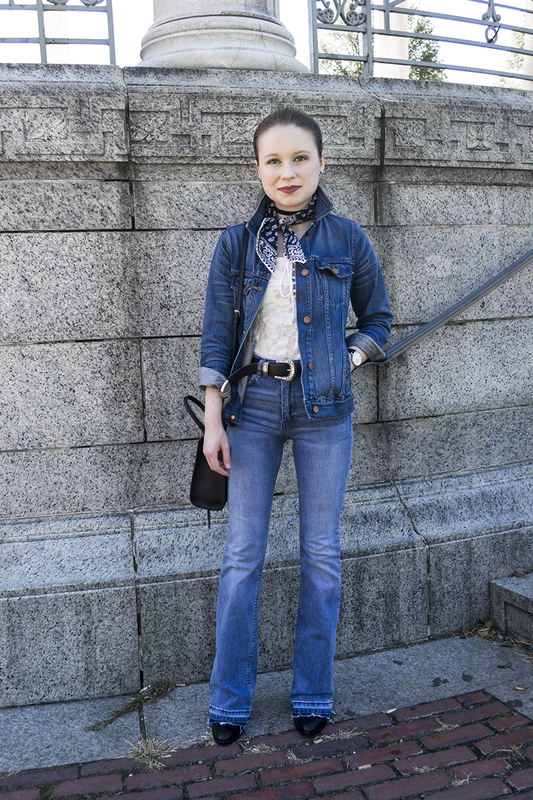 FTC: This post was sponsored by Madewell. All opinions are authentic and my own. I like how you popped the collar!